One of the best thing when traveling is saving a few hundreds or thousands. Who wouldn’t want to go travel at a discounted rate? After writing the ‘How to make money online to fund your travels’ article, I got the idea of writing this next article – where to get discounts for your travels. Whenever I travel, I always try to look for sales, discounts and deals online before hitting that ‘book now’ button. So in this article, I thought of sharing a few websites and apps to help save money and get discounts for your travels. Ever since I started traveling outside of my home province, I’ve been using traveloka.com. You can download the mobile application or use their website to book hotels and flights. Traveloka often provides hotel discounts and flight deals. If I remember correctly, they give discounts for as big as P1,000+. Make your dream trip come true and book with Traveloka. If you want to try staying at cheaper accommodations, try Airbnb. Download their mobile application today and find your next staycation. There are a lot of unique and creative spaces that you can book here. You can even find castles and movie-themed houses here. 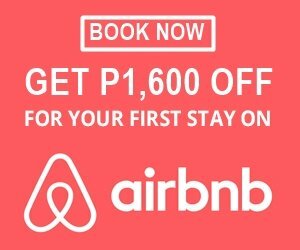 Sign up today and get P1,600 off your first booking of ₱3,500 or more. I’ve been to a lot of places and wish I knew about Klook sooner. Klook offers tours and travel packages that are way cheaper. You can save a lot of money and headache by booking with them. Tours will even go and fetch you from your hotels, how cool is that? Download their app today or book through their website and travel cheaper with less hassle. You’ll never know what the future holds or what unforeseen circumstance you might face while traveling. Use Gobear.com to secure your trip with affordable travel insurance packages. The GoBear comparison tool allows you to compare travel insurance, choose the one that suits your need and gives you the peace of mind throughout your trip. For as low as Php184, you’ll get covered for personal accidents, medical expenses, trip cancellations and loss of baggage depending on your destination. Spending a few bucks won’t hurt much especially if you know your trip is secured. Metrodeal is one website where you can buy discounted vouchers. They have tour packages, hotel rooms, resorts, buffets even salon and beauty vouchers at a discounted rate. Take note, though, if you found something you like, be quick to decide since some of their vouchers are not always available and are only sold at a limited time. Ah yes! Piso fares. It’s what most Filipinos look forward to. Technically, piso fares are offered by airlines especially AirAsia and Cebu Pacific. You only need to pay 1 peso for the base fare. This does not include the tax and many many others. So don’t be shocked if you have to pay 500+ for a one way ticket during a piso fare sale. Despite this, the overall price for your booking will still be way cheaper than the regular fare price. The Philippines only has two seasons- the rainy season and the not rainy season. The rainy season is often the off-peak season of most hotels and resorts. This means that only a few people are booking their place. As such, they offer rainy deals in hopes of getting a few more customers. These deals can go as high as 50% off their regular rate. Most often, you can find these rainy deals posted on the hotel or resort’s Facebook page or website. So if you have a place in mind, go check out their Facebook page and website. Who knows? You might score a rainy deal. Here are a few examples. Additional Tip: As much as possible, avoid booking a place during holidays and weekends. These are when their prices are at an all time high. Weekdays and non-holiday days are often cheaper. Did you like the article? Like and follow Wanderera on Facebook and Instagram for more updates. Hover over the images to pin.